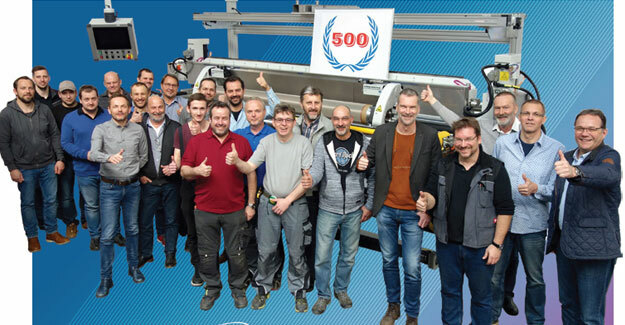 Zimmer has successfully shipped its 500th MAGNOROLL coating machine. “A milestone indeed and honour for us as well“, says Bruce Stalker from Eclipse Blinds, excited to receive the machine in Scotland. Nowadays, the MAGNOROLL coating machine is equipped with state-of-the-art operating software. The machine comes in a unique modular design execution that combines various coating techniques (knife, screen, slot or magnet roll coating) within just one machine. This minimises machine downtimes and ensures quick adaptation to specific requirements. Concentricity, accuracy and precision are crucial for quality results, especially when applying coatings on large working widths. The world-famous ZIMMER MAGNET SYSTEM PLUS with up to three magnet bars, guarantees a 100% uniform application for any coating, laminating and lacquering. ZIMMER AUSTRIA coating systems ensure the needed accuracy and precision for applying coatings also on working widths larger than five metres. ZIMMER AUSTRIA provides the industry the opportunity to run trials or even small-scale productions at its Technology. Application Centre in Klagenfurt. Depending on the individual requirements, the company offers a variety of standard and special coating techniques to be tested together with expert technologists, such as knife coating combined with screen printing.